I wasn’t looking for a car, but when my wife’s car took a turn for the worse and we decided to become a one car household, my two-door sport coupe had to go to make room for our new family car. Prior to purchasing our new car, we had switched to sourcing our home energy from renewable sources, so we were already very conscious about our impact on the environment. Continuing that trend, we wanted to do the best we could sustainably with the technology available in August of 2016. 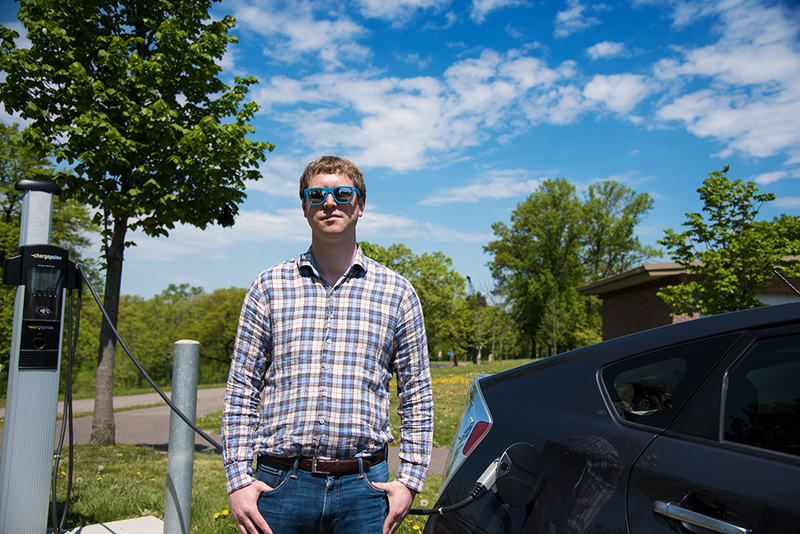 Our first inclination was a used Toyota Prius—great MPG and known to be a reliable car. After some research on the used Toyota Prius market in Minnesota, we discovered the Toyota Prius Plug-In, a car that can run in electric mode up to 62mph for an EPA estimated 11 miles and would be assisted by the hybrid internal combustion engine if extra power was needed. We could expect to see a 95MPGe with the car running only in electric mode and 50MPG in hybrid mode. We reasoned that the electric range would be enough for round-trip travel for both of our work commutes. Additionally, for trips outside Minneapolis, we could rely on the most efficient gas engine to get us there. When we got the car, I noticed a display showing the number of electric miles versus gas miles it had been driven. The previous owner had put 38,500 miles on the car, but had driven it electric only 2% of the time (about 900 miles). I was unaware at the time, but this was the start of our trek to try and only use electricity to power our vehicle. My daily commute is about 2.5 miles each way, with a max speed of 45mph, consisting of a few stop signs and stop lights. Most days, I return home with 6 miles of electric range. On days when I take my coworkers out for lunch or run errands on the way home, I find I’m still able to complete my commute using only energy stored in the electric battery to power the car. The most rewarding feeling is ending a drive with a consumption of fuel of 999MPG. Dashboard showing no gas used, 999MPG! During summer and winter, I avoided using the Auto button for climate control. Pressing the Auto button initially blasts the fan at max settings, immediately triggering the internal combustion engine. On warmer days, I used low fan settings and turned the A/C on sparingly. Using the A/C drops the estimated range approximately 1 mile. On colder days, I avoided turning on the heat when possible, and instead relied on the built-in seat warmers. However, it is difficult to completely avoid using the internal combustion engine on the coldest Minnesota days as the car automatically warms itself when it gets below a certain temperature. I maximized my car’s regenerative braking capabilities to the fullest by only accelerating as much as I needed to and coasted whenever possible until the next red light. I used public charging infrastructure, locating the nearest ones with an app called PlugShare, to extend my range. I took advantage of Level 2 Chargers at parks across the city, which allowed me to not use any gas. Each hour at a Level 2 Charger gives my plug-in EV up to 8 miles of range, so it takes less than two hours to fully charge. Newer plug-in EVs with a 6.6kW or higher charging rate (think Ford Focus Electric and 2016/2017 Nissan Leafs) receive 25 miles of range or more per hour at a Level 2 Charger. Our dashboard showing EV usage has increased to 6% overall! Using the three strategies above over the past 8 months, I’ve witnessed the car’s EV usage grow from only 2% (900 miles) to 6% (3035 miles) taking overall mileage into account. Newer Plug-In Hybrid Electric Vehicles have larger batteries with longer ranges, and I think more and more people will see 90% of their driving can be done with the electric range. While we were initially just looking for better fuel economy, I am pleasantly surprised that greater than 1/3 of our miles are electric. In fact, our experience of owning a plug-in hybrid electric vehicle inspired us to put a deposit down on a Tesla Model 3 last month, and we’re already looking forward to having a longer electric range.